A resting place for 7000 Soviet soldiers who fell during the World War II, Slavin Memorial is the city’s way to remember their contribution to the country. 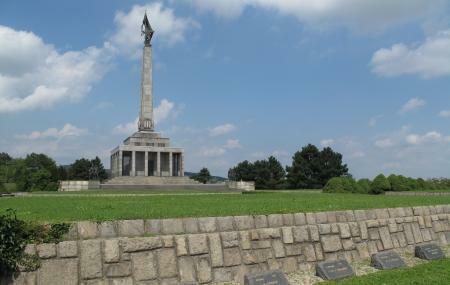 The Cemetery and Memorial is located on a beautiful, small hill offering a fantastic view of Bratislava. The main monument is located in the center of the place and consists of a 11-meter-high sculpture of a soldier holding a Flag. The monument itself is 391-meter high. The memorial is a must-visit if you want to see yet another of Bratislava’s war chapters. How popular is Slavin War Memorial? People normally club together Bratislava Old Town and Man At Work- Cumil while planning their visit to Slavin War Memorial. Monumental WWII memorial. Good view across Bratislava but nothing special. Once in the life try view the sunset from here you will not be disappointed. Only 30 minute walk from the old town. Very strong touch of the past. Simple, but powerful. I would climb the hill just to pay respect to those, who gave their lifes to free this country, but the view and the atmosphere of the place was very rewarding. A nice war memoriap on top of a hill. It's a good 15 minute climb to the top but you can take a taxi or the tourost train thing. A decent view opens up, however castle was blocked by trees from whichever angle we tried to photograph it. If you're looking for views I would suggest going to the Bratislava castle.